A Answered on 1/10/2019 by InyoPools Product Specialist Lennox H.
Hi, John. The Dura-Glas Pumps can self-prime up to 15 ft above the water level. As far as being a great irrigation pump, it's not designed to be. I have a stay rite duraglass 1 HP pump, Tank body has developed a leak (small crack in 25 year old pump). It works fine but has a drip leak near dischaarge fitting. Your website shows a (Key 15) part no 5056-71 "Tank body" that looks like mine. Will it fit? I would also want a (Key14) O ring and a (Key 28) rubber gasket. A Answered on 9/15/2018 by InyoPools Product Specialist Lennox H.
Hi, Sidney. With the pump being that old, I would recommend replacing the entire pump. If you're unable to then replacing those parts will be sufficient. I have a P2R A5E - 124L pump. It is attached to a 1 HP, 3450 rpm motor. What is the flow rate and pumping pressure of the pump? A Answered on 8/28/2018 by InyoPools Product Specialist Lennox H.
Hi, David. To calculate the flow rate of this pump, you will need to know the Total Dynamic Head (TDH) of your pool. 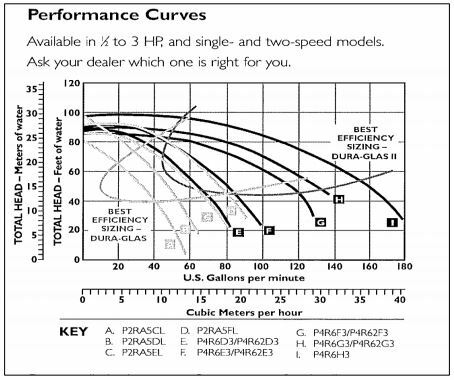 Once you've calculated the TDH, use the Sta-Rite Dura-Glas Pump Curve to determine the flow. You can use these following guides that we have, How to Size a Pool Pump, How To Measure Total Dynamic Head With Gauges and How Do I Calculate Feet of Head for My Pool? Sta-Rite P2RA5E (124L) 1C91U need to replace housing . Will Pentair Pump Housing Sta-Rite - C176-47P1 do? Hi, Jay. Yes, the Tank Body - C176-47P1 is the correct replacement for the Sta-Rite P2RA5E-124L model pump. To view all the other available replacement parts use the Sta-Rite Dura-Glas and Max-E-Glas Parts Diagram. I need the square cut seal plate o-ring, part number 375099Z and I can't seem to find it ANYWHERE. Everyone is listing the round o-ring U9-228A. I doubt the are interchangeable, am I correct? Can you get the correct o-ring? Hi, Erik. The Round and Square Seal Plate O-rings are not interchangeable. We will have to special order Part # 357099Z. A Answered on 8/21/2017 by InyoPools Product Specialist Stacey M.
Hello, the closest unit that we have in replacement for the P2RA5E model is Super Max 1HP Pump - PHK2RA6E102L. Hello- The drop in replacement for that model Dura-glas is the Speck EasyFit MXG 1HP Max Rated Pump - IG281-1100M-0DG. I have a StaRite P2R A5E-1241. I only need a motor. suggestions? Hello Jim, I would check specs, but from the match of this it looks like you have motor sq1102 and seal kit GOKIT54, please make sure if you have the copper insert it needs to be removed for tthe seal kit recommended. Hello Diane, the Speck EasyFit MXG 1HP Max Rated Pump - IG281-1100M-0DG would be a direct replacement. Please double check product specs to make sure this will fit your needs. A Answered on 10/4/2016 by InyoPools Product Specialist Lennox H.
Hi, Diane. The Speck EasyFit MXG 1HP Max Rated Pump (IG281-1100M-0DG) is a drop-in replacement for the Sta-Rite P2RA5E pump. We will need additional info like the "Feet of Head" to calculate the flow rate to make sure that it does not exceed the flow rate of the Sta-Rite Posi--Flo PTM70. Hi Terry, Our How To: Wire A Pool Pump guide provides step by step wiring instructions. I would like to know which pump that can be ordered from you would replaces the STA-Rite Dura Glas model # P2RA5YE-181L, 60HZ, 230V 1-1/6 HP motor model C48K2P105, RPM 3450/1725.Our pool pump is still OK but I would like to have a replacement just in case. Thanks! Hi Corrado, The Speck EasyFit MXG (IG281-2100M-0DG) will be a direct replacement for your Sta-Rite P2RA5YE-181L pump. I would like to know what pump replaces the one I have with model # as shown below: P2R A5E-124L CODE #: 1C96H By the way, is this the best pump suitable for S. FL weather? Thank you! A Answered on 2/10/2016 by InyoPools Product Specialist Robert M.
Hello Marcelo - The Sta-Rite Dura-glas Pump 1 HP Single Speed Pump (P2RA5E) is no longer available but the Speck EasyFit MXG 1HP Max Rated Pump (IG281-1100M-0DG) would be a direct replacement. Hello, I have a pool pump that I believe is Sta-rite P2RA5E. (the label is not so good). The pump motor is a marathon 1 hp single speed, frame 56z, square flange, model 5kc38sn6084ax. I would like to replace it with a dual speed (pool is in florida). I saw a a.o smith dual speed on your site (Pool Motor Square Flange 1 HP Full Rate Dual Speed w/ Digital Controller (B2982T), and i would like to know if this is a viable replacement. At this time I am not sure of voltage or amps to the pump. Hi Michael, The A.O. Smith 3/4 HP Full Rated Dual Speed Motor w/ Digital Controller (B2980T) or (B2981T) would be the correct replacement motor once you confirm the voltage to replace the Marathon 5KC38SN6084AX motor. I need to know what pool pump replaces the STA-Rite Dura Glas model # P2RA5E-181L, serial #035507R, 60HZ, 115/230V Our pool pump went out on us and we need another one that will fit and work. Thanks! Hi Ray, The Sta-Rite Dura-glas Pump 1 HP Single Speed Pump (P2RA5E) is no longer available but the Speck EasyFit MXG 1HP Max Rated Pump (IG281-1100M-0DG) would be a direct replacement. Great product. Great price. Quick ship. You get what you order. direct replacement. I am so pleased with this pump. Apparently my old one had been malfunctioning for a long time. The new one came completely assembled and ready to install. No problems. The new pump has my pool circulation running as it should.